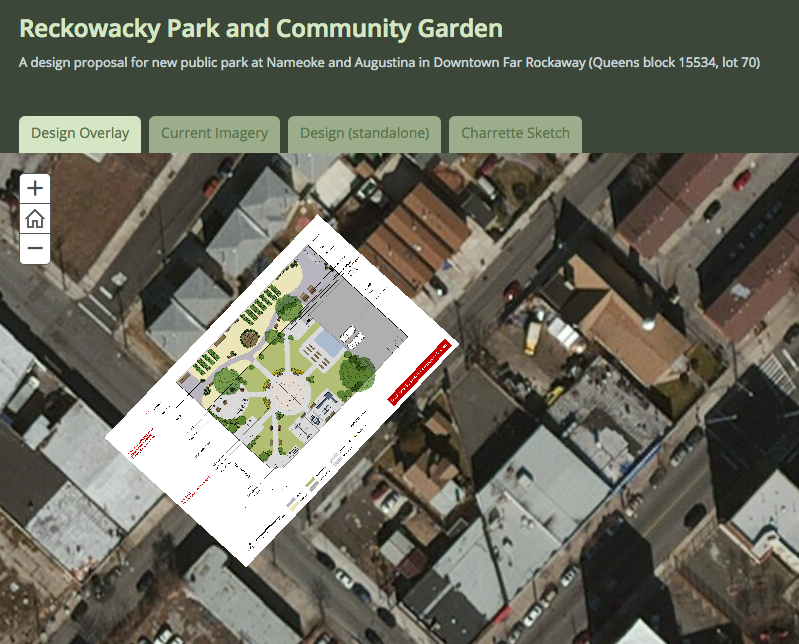 This week, we sent NYC Parks the updated design for the new park that will replace a long vacant city-owned lot, coming to downtown Far Rockaway as a result of over a year long local advocacy campaign! We are requesting that the future park follow this design. This will make the park the most relevant because it was planned by the people who know best what their neighborhood needs, and because their very advocacy is what protected the potential of this public land in the first place. 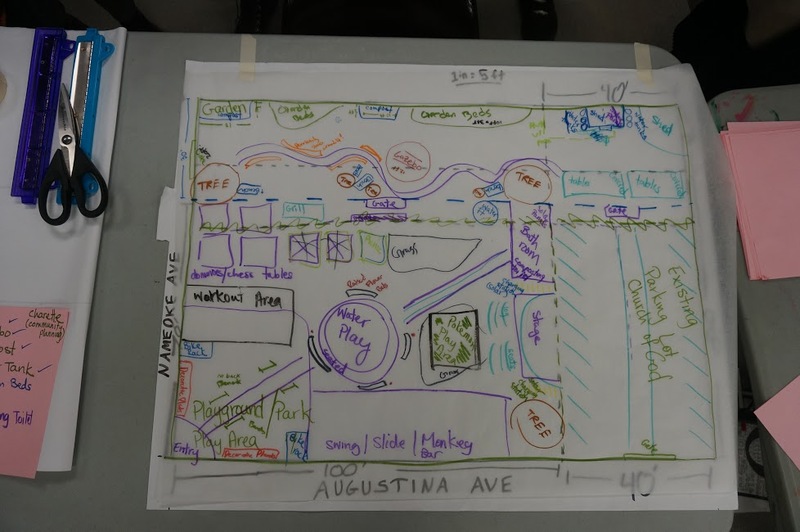 Allison Jeffrey had long envisioned how the vacant city-owned lot on her corner, at Nameoke and Augustina Aves, could serve her neighborhood as a community green space. In September 2016, she reached out to us for support in making visions for a stronger, healthier neighborhood real. 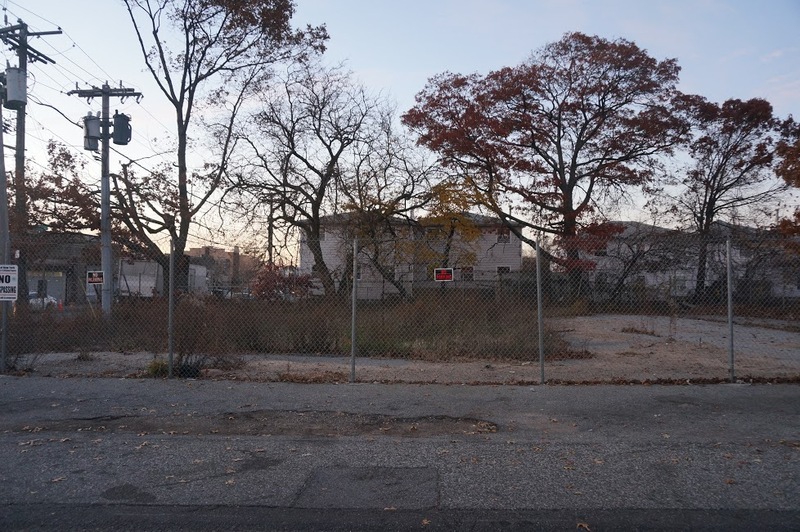 Just then, the city announced its plans to sell the lot to a developer to build suburban-style housing as a small part of the Downtown Far Rockaway Redevelopment Project! 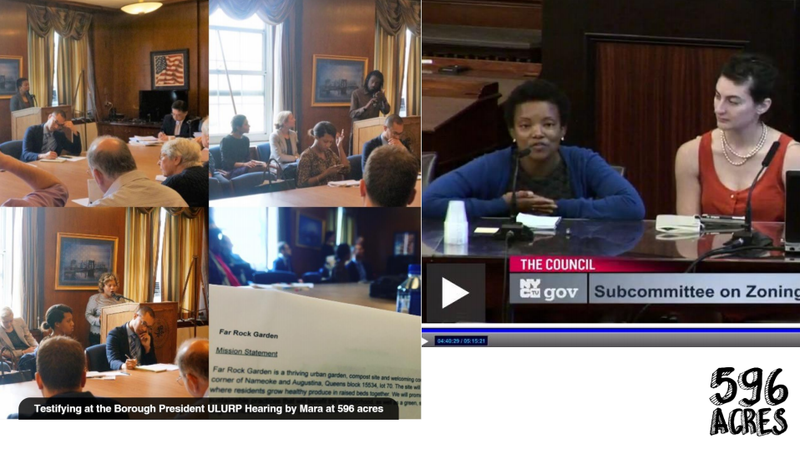 With their defined vision of a community green space and persistent testimony, Allison, joined by fellow resident/master composter Travis Anderson and other neighbors, advocated at each step of ULURP, the process that NYC uses to make sure elected officials and the public review big land use decisions including selling public land (learn more about that process here). Their advocacy worked! They prevented the lot from being sold, and not only that: a future NYC Park here is now part of the City’s plan! Funding and other resources have been committed: see the first highlight listed in the City’s press release here. Thank you to Council Member Donovan Richards and others who advocated and listened to local residents as they create the future community assets of their neighborhood! The park includes a community garden area, which neighbors will steward to grow healthy food and turn organic waste into productive compost; a passive park which NYC Parks staff can maintain with a play area for kids, a workout area for adults, a performance area for artists, and a chill out area for everyone; plus an NYC Parks parking area to serve park-goers and the church across the street! This mix of uses is designed so that the place can serve everyone’s hopes and needs. Community leadership of design, and longterm governance of the garden area, will support local infrastructure and social resilience. 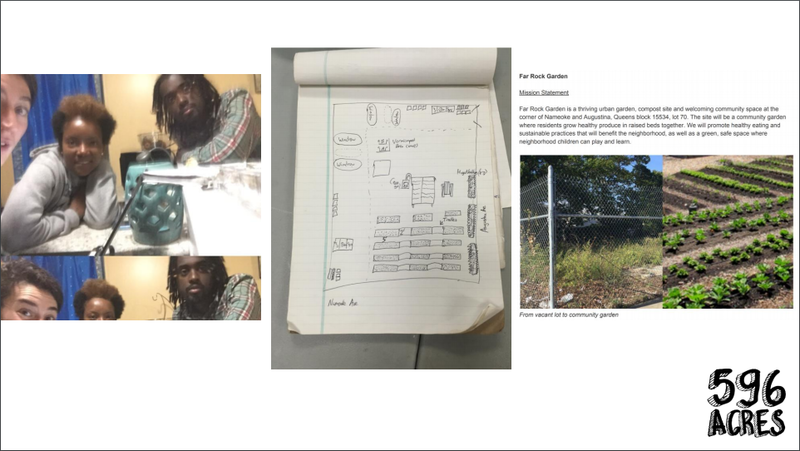 Along with sending NYC Parks’ Deputy Director this design and CCing lots of relevant people (check the footers of the letters below), we also included letters from organizers and 596 Acres highlighting our request, plus supplementary materials that document the advocacy story and indicate community support for this place. For next steps, we suggested we all get together in the new year to plan the future park together, led by those most impacted. You can view the whole PDF we mailed (with organizers’ contact info removed) here. 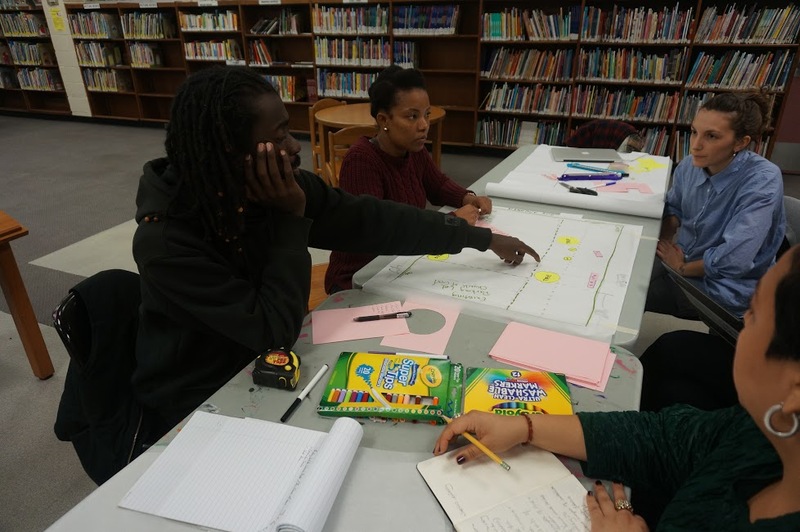 Thank you to the local advocates whose vision of potential is protecting land for community strength in downtown Far Rockaway! Thank you to Celina Lacaze and Sam Raby for design support. 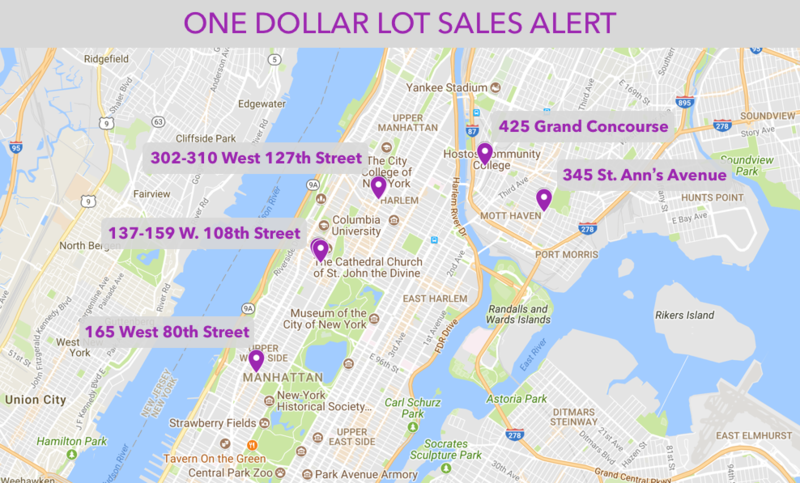 To get involved, contact Travis at t.andersoncap@gmail.com or (646) 662-0585, Allison at afionaj@gmail.com or (917) 836-0688, or sign up to Organize on the lot page here, where you can also view organizing history: livinglotsnyc.org/lot/4155340070/. We are thrilled that a new public park is coming to the corner of Nameoke and Augustina Avenues in downtown Far Rockaway as part of the Downtown Far Rockaway Redevelopment Project! This results from over a year of advocacy by local residents, Allison Jeffrey and Travis Anderson, who identified a vacant public site on their block as a great location for creating the community open space they know their neighborhood needs, and who prevented the city from selling it as originally proposed by NYCEDC. 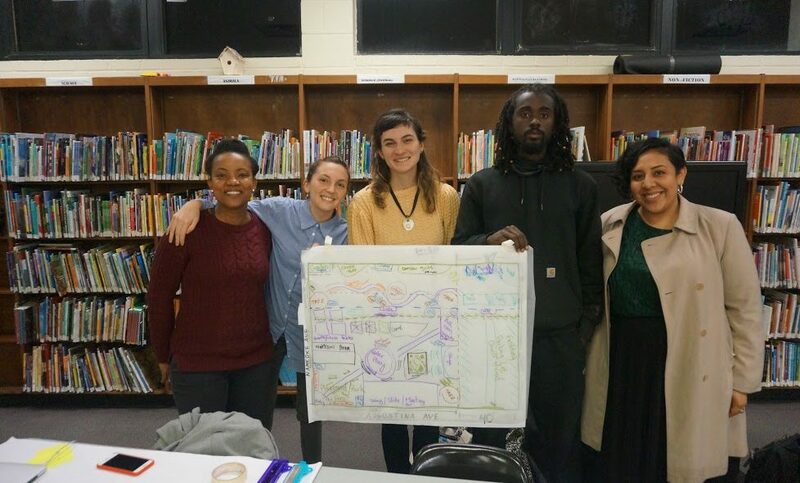 Their campaign brought together hundreds of neighbors, winning the support of Council Member Donovan Richards (cc’d), who are are thankful championed their vision through the ULURP process! 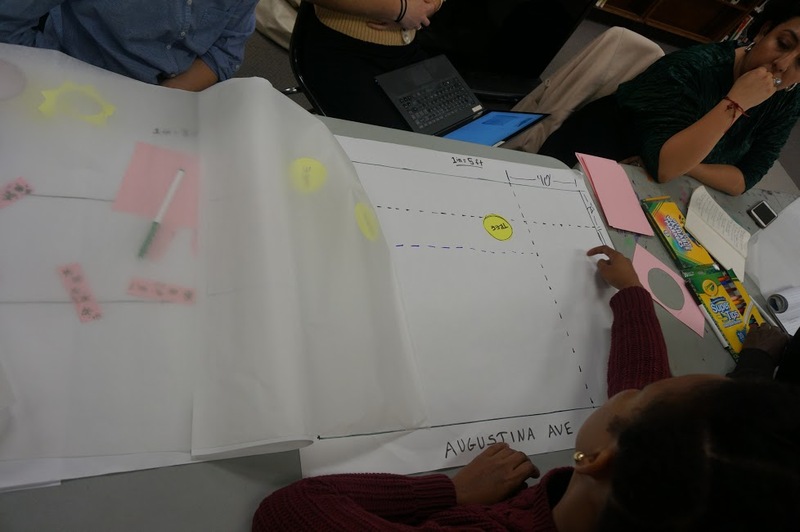 The neighbors whose advocacy resulted in this future park are in the best position to continue leading its design; they know most intimately what will best serve the needs and wishes of their neighborhood! 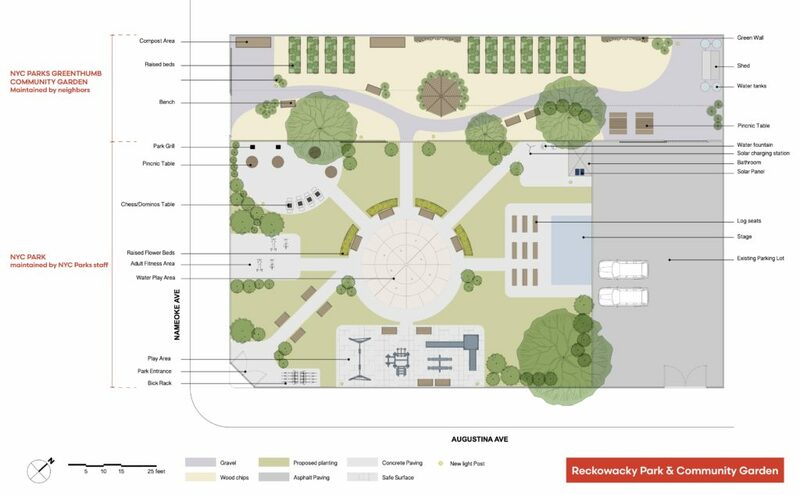 Rebecca Gavert of NYCEDC (cc’d) mentioned you are working on planning this future park, and I have also cc’d Senior Project Planner Mitchel Loring because we spoke about this potential location for a park earlier this year. Attached, please find local advocates’ design for the future park, the outcome of a design charrette they led at the local library this month. We are requesting that the future park follow the enclosed design which was created by the people who know best what their neighborhood needs. As you will see, the future park, which neighbors named Reckowacky Park & Community Garden after their Native American ancestors and the peninsula’s original inhabitants, includes both a passive recreation space that will be created and maintained by NYC Parks staff, and a community garden area that will be created and maintained by neighbors via NYC Parks GreenThumb. In addition, it has a third area that they wish to continue serving as a community parking lot (the school and church across the street have historically used it this way), updated and managed by NYC Parks, also serving park-goers. 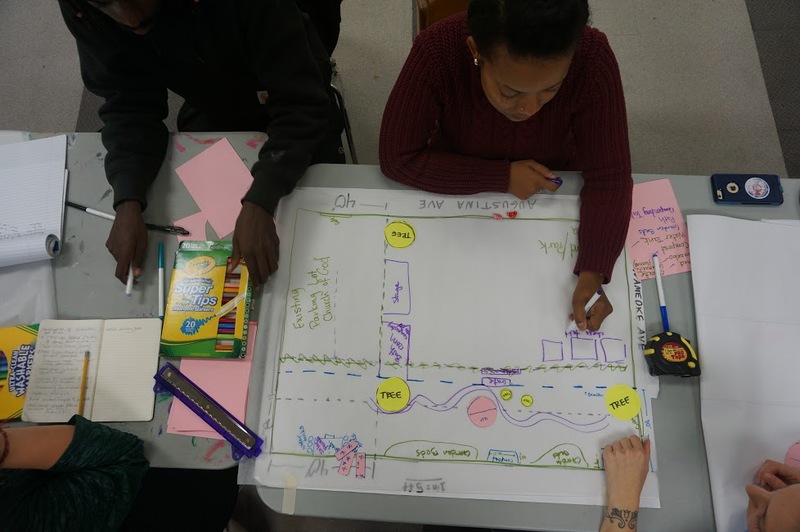 (As inspiration for NYC Parks that include both passive recreation space maintained by NYC Parks and community gardens maintained by neighbors via GreenThumb, please see the design for Little Claremont Park in the Bronx, enclosed, and the plan for Maple Street Community Garden in Brooklyn. Longtime Downtown Far Rockaway residents Allison and Travis, who each wrote a letter enclosed, have lived near this unused Department of Sanitation lot for decades. Allison has lived directly next to it, and it is her vision and advocacy that exposed the potential of this location as open space to everyone else. 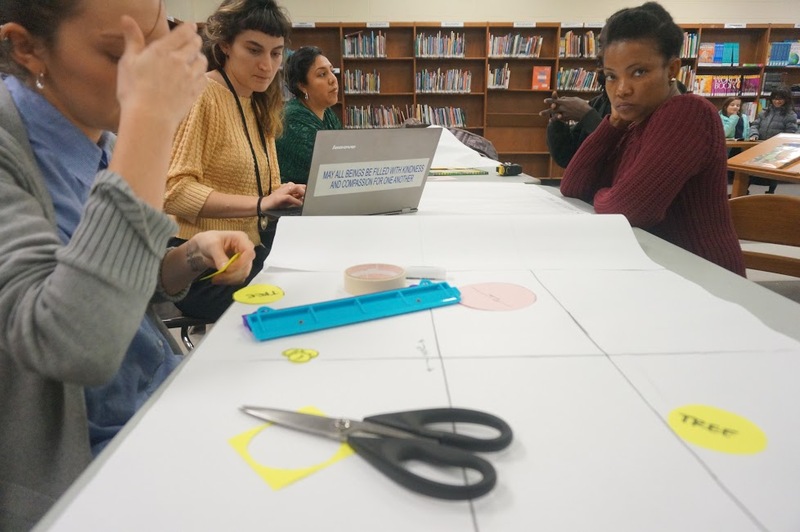 Developing plans with dozens of neighbors and winning support from hundreds more, their grassroots advocacy is what prevented the lot’s disposition and got it written as a future NYC Park into the Downtown Far Rockaway Redevelopment Project plan. 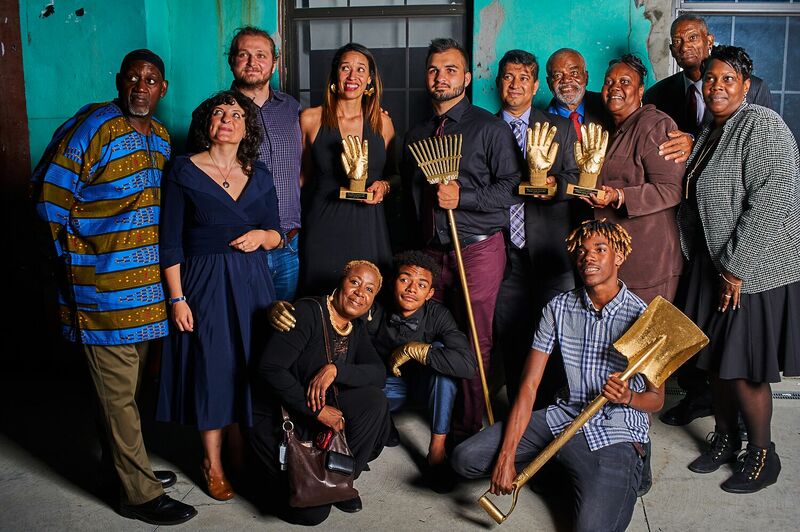 My organization, 596 Acres, has helped residents transform 37 vacant lots across NYC into thriving community open spaces, and stands ready to continue supporting these residents in helping design and steward this future public park so it becomes a sustainable and thriving local institution. I suggest we all meet in the next weeks so Allison and Travis can present their design in person, and we can move forward in planning this future park together! Please contact us using the information provided in the letterhead. Thank you in advance for working towards making these local leaders’ vision for a community open space here a reality! My name is Allison Jeffrey and I, along with the residents of Far Rockaway are thrilled that you are planning to develop a park at Queens Block 15534 Lot 70 at the corner of Augustina and Nameoke Avenues. I have lived in Far Rockaway for the past 30 years with my parents and siblings, all nearby. 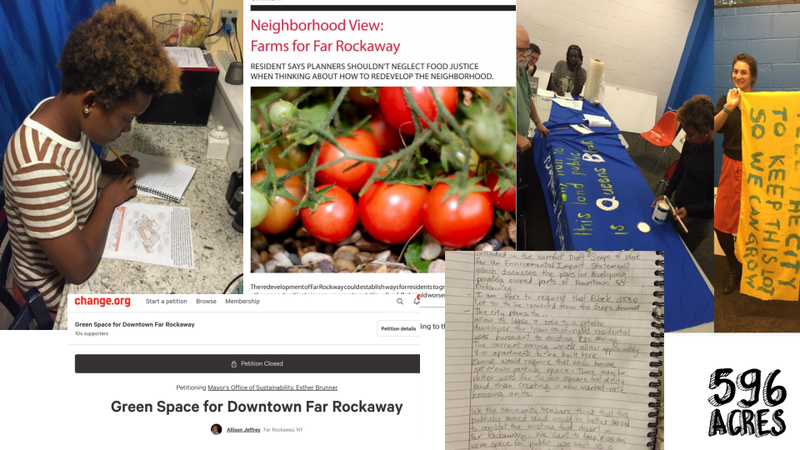 Over a year ago, it was my vision to start a community garden to address the food desert that is Far Rockaway. 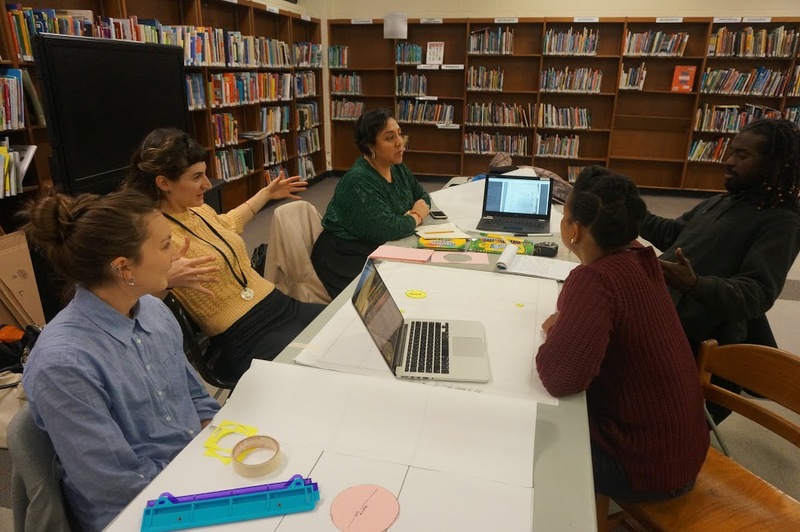 Through the past year’s journey, neighbors and I have collected over 400 signatures online and on paper, met in the local library to discuss and share ideas, and advocated at City Hall, Queens Borough Office, City Council Member meetings, and Community Board meetings. 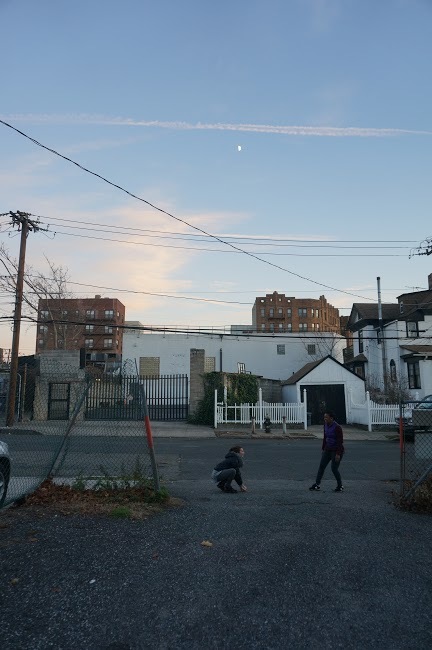 Queens Block 15534 Lot 70 is source of our vision for a community garden and playground. 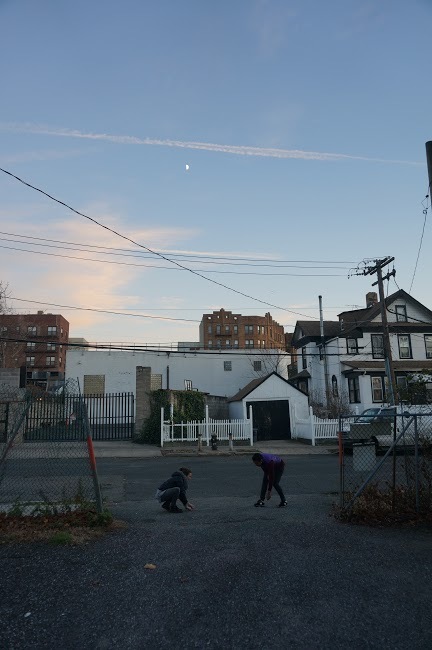 Although the lot has been abandoned by the City for years, the space is important to us and we deem it vital in impacting the landscape and health and lives of ALL residents of our community. We stand to benefit from the gardening and composting that will be produced from the land. We are also thrilled that now our children will have a safe place to play. The attached package is a repository of artifacts and information that I and other community members would like to share with you in support of our vision for the development and use of this space. Thank you in advance for your time and collaborative efforts in preserving and beautifying our community. 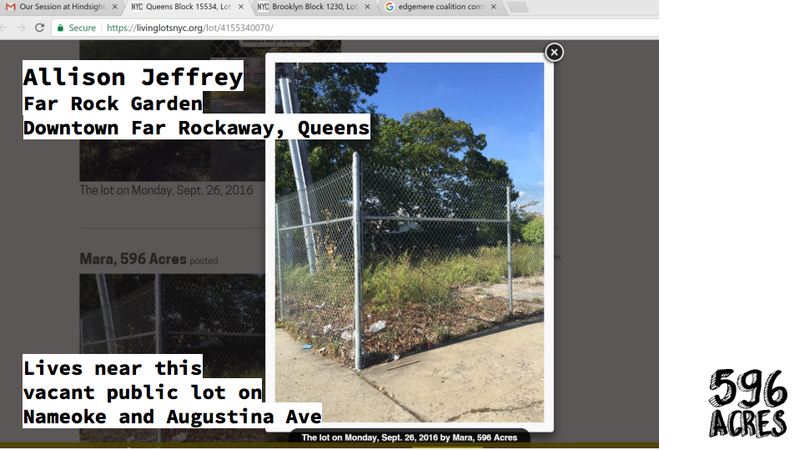 My name is Travis Anderson and I am a current resident of Far Rockaway. Since graduating the Master Composters Course hosted by NYC Compost Project in 2016, I thought of the lot on the corner of Augustina Avenue and Nameoke Avenue as a place to compost. Since there was a sign on the fence of the lot stating that the Department of Sanitation owned it, I figured that it would be possible to use it for composting; however, that was not the case. A year later, local residents, Allison and myself, have managed to convince local officials and city officials to recognize the importance of a public owned lot being utilized as a productive and entertaining green space rather than another impermeable structure. I have gotten positive reviews from neighbors I know who signed the petition and are excited to see something close by that offers the same benefits as if visiting Bayswater Park. I personally know that having this space remain a public space will ensure a more happy and robust Downtown Rockaway community. Please see the enclosed design we created for the space.